This document outlines the Department of Police and Emergency Management (DPEM) strategic priorities for 2012-2013 which are linked to each of the Output Groups, and the other areas of focus. These priorities do not cover all the work that is undertaken over the twelve-month period because each Command and Business Unit has its own detailed Action Plan. Some priorities will occur over a longer period than the twelve months. Performance measures are included to indicate progress towards realising the aim of each Output Group and other areas. These measures form part of a suite of performance measures used throughout the Department to measure performance. To meet DPEM’s Vision of ‘a safe, secure and resilient Tasmania’ the Department will focus on the Values of Integrity, Equity and Accountability, as these provide a sound foundation for the types of ethical behaviour expected from our people. This behaviour will be demonstrated in every aspect of our work, including when we deliver services to the community, and when interacting with each other. Given the significant financial constraints being experienced across the Tasmanian public sector in the next twelve months the Department will focus on People, Innovation and Business to enhance our service. The Department has developed a Strategic Direction document which establishes the longer-term pathway for the organisation during the period 2012 to 2017 and beyond. The document identifies a number of aspirational goals to provide a long-term strategic vision of DPEM’s business beyond the pursuit of the Strategic Direction document. Output Group 4 > Emergency Management. The operational delivery of the services that are included within each Output Group are reflected in the Command Action Plans and the delivery of business outcomes in the areas of People, Innovation and Business are reflected in the Department’s Business Unit’s Action Plans. threatening people or groups to be ≤ national average**. Offences committed while on bail. Review and implement specialist capability arrangements. To achieve our Mission of providing a quality policing and emergency management service, DPEM will deliver strong leadership at all levels of the organisation with an emphasis on People, Innovation and Business. All implementation requirements are met (National Model Workplace Safety Legislation). Understanding of organisational Values and Service Charter in each workplace. effective and efficient development and use of resources and systems. Use of scientific equipment to improve efficiency. Graduated implementation of Social Media Policy developed in 2011-12. Greater access to mobile data for operational police and emergency management. Compliance with Speed Camera Operating Criteria. Review of Graduated Management Model in conjunction with the Integrity Commission. Implement revised fleet management arrangements. Forensic test turnaround time reduced. Reduction in complaints involving conflict of interest. Number of CCTV network access points in police stations. 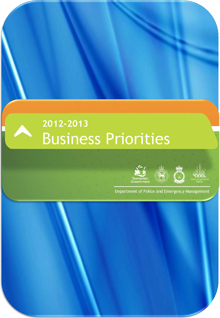 For further information view the Department of Police and Emergency Management ‘Business Priorities 2012-2013’. This page -- https://www.police.tas.gov.au/historical-corporate-documents/business-priorities-2012-2013/ -- was last published on July 11, 2018 by the Department of Police, Fire and Emergency Management.